We just had time for a short four-day hike in the Dolomites, prior to leaving Italy and returning to the UK for the first part of our cycle adventure around Scotland. The Dolomites, close to the Austrian border in the far north-east of Italy, is a mountain range I have wanted to visit for a long time. It’s famous for dramatic rock spires and impossibly sheer faces of rock, rising up from pine-clad valleys. I was expecting some amazing mountain views, but I wasn’t sure if we’d be climbing any summits. 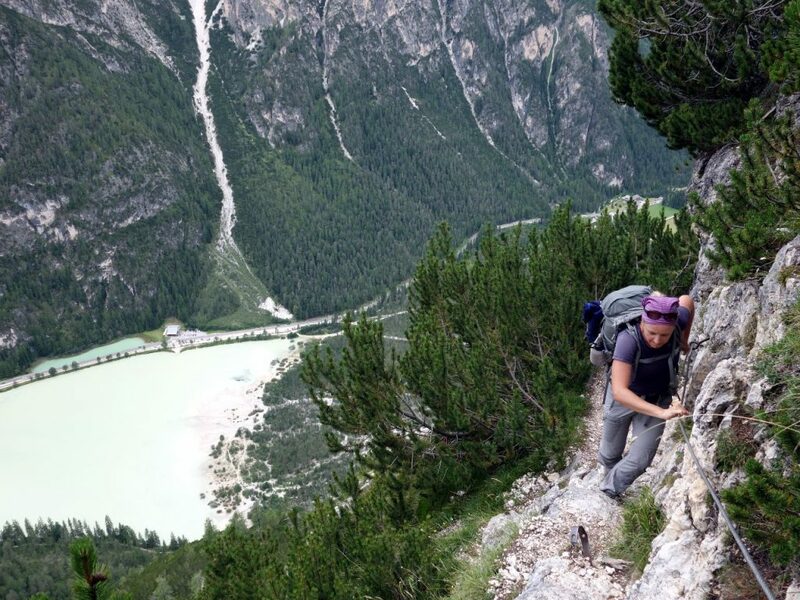 The Dolomites are also known as the birthplace of via ferrata – the “Iron Way”. These are severe routes rendered accessible by a network of metal cables, pitons, rungs and ladders attached to the rock. They were first erected during the First World War, when the Dolomites were a battleground, to enable soldiers to pass across otherwise impossible terrain. After the war, the routes remained. They were expanded and repurposed for leisure, providing an alternative means of climbing difficult mountains. The presence of permanent cables means the routes can be climbed solo, without the need of a climbing partner to secure you with a belay. The bolts, rungs and ladders also open up some of the easier routes to hikers. Although some knowledge of technical safety equipment is necessary, it’s far less than you need for proper rock climbing, which involves a large amount of what we hikers call “buggering about with ropes”. 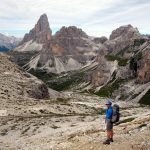 We looked upon our four days in the Dolomites as a reconnaissance: an easy hike from hut to hut, carrying little more than a day pack. We had no set itinerary, and chose our route from day to day. On all four days, we even ended up modifying our route as the day progressed. 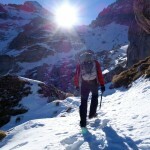 Our aim was to check out the best approach for hiking in the Dolomites. We carried no technical equipment, so we had no plans to complete any via ferrata routes, but we kept an eye on those who were, with an eye to returning there to climb some vie ferrate in the future. In this respect, it was a successful reconnaissance. The hike was super enjoyable, and we can do a much longer one next time. We also discovered nearly all we need to know to climb some easy via ferrata routes, with the exception of a full demonstration of how to use a via ferrata rig. This will require a little more research. My first step was to buy a copy of the Cicerone guidebook Walking in the Dolomites by Gillian Price. This covers 25 short routes of from two to four days, the ideal length for this short trip of ours. In fact, we didn’t do any of the walks in the book, but it provided enough information to get started. 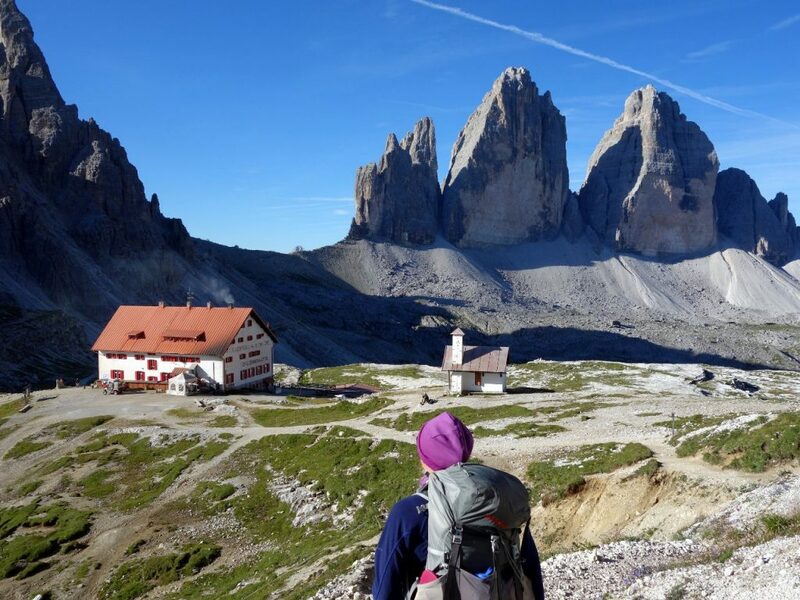 After reading some of the descriptions, we chose the Sesto Dolomites for our hike, because I had a craving to do a complete circuit of the three dramatic rock towers of Tre Cime di Lavaredo (a circuit we completed in a single morning). The book gave us enough information on hut routine to know that we didn’t need to carry sleeping bags or food, because sheets and cooked meals would always be available. It also pointed me in the direction of the relevant map: Tabacco 010, Dolomiti di Sesto. The 1:25,000 Tabacco map series is perfect for hiking. 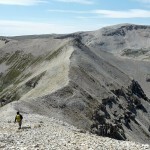 Trails are clearly marked as easy, or for expert hikers only, and all huts are marked. This meant we could choose our route as we went along. The maps also mark via ferrata routes with crosses, but they don’t indicate the grade. We weren’t carrying safety equipment, so this meant we didn’t know whether these routes would be suitable for us until we got there. Some were, some weren’t, so there were a couple of occasions when we had to retrace our steps. In addition to technical equipment, the other essential item for via ferrata routes would be a technical guidebook. Routes (and even just sections of routes) are graded A to E. A routes are suitable for confident hikers without technical gear, and we probably passed a few of these without realising. We spoke to a young Austrian couple, who explained that C routes could be vertical with ladders, while on D routes you might need to rock climb. All in all then, a successful reconnaissance. I took some notes, and intend to write a full trip report when I have a chance. Unfortunately we also discovered a certain incompatibility. While Edita seemed keen to shoot up C routes even without safety equipment, I’m a comparative wimp when it comes to unprotected exposure (as the bishop said to the actress). Whether these differences can be resolved, either with ropes, alcohol or warm-hearted agreement, only time will tell. I have one final piece of advice to anyone hiking in the Dolomites. It’s worth joining an alpine club beforehand, as the discount you will receive in the mountain huts, even for a short trip like ours, will more than cover your annual subscription fee. I can recommend the Austrian Alpine Club, whose membership benefits include insurance for search and rescue. This is essential if you are going to be climbing vie ferrate, where falls or injury from rockfall would almost certainly require helicopter evacuation. In the one hut that I produced my British Mountaineering Council (BMC) membership card, hoping for a discount, the chap at the desk laughed and charged me the full price. I don’t know what he found so funny, but perhaps he was thinking of Brexit. He probably took you for a chancer rather than an honest but ill-informed BMC member – since most national Alpine clubs include reciprocal hut rights along with the cost of membership, hut guardians sometimes don’t realise that membership of the BMC (which doesn’t operate any huts) doesn’t include these benefits and incorrectly give discounts to BMC members. It has been known for cheeky and/or impecunious Brits to take advantage of their ignorance in this way. Really, you ought to show a reciprocal rights card (£45), or, as you suggest, join a continental Alpine club (or even the British one, which does operate a hut or two and thus benefits from the reciprocal-discount arrangement). I read your blog with interest. I would definitely recommend you pick up the Cicerone guidebook – ‘Via Ferratas of the Italian Dolomites’ (Vol1 and Vol2) by John Smith and Graham Fletcher. 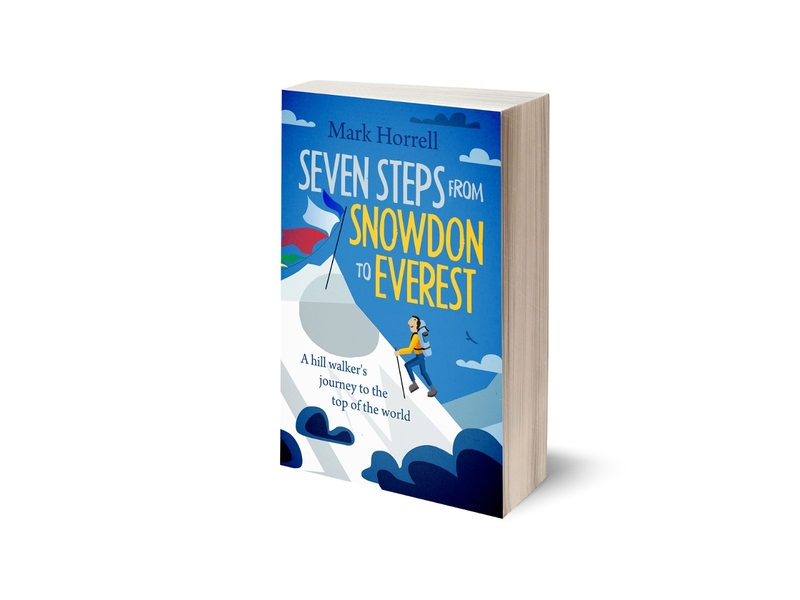 With decent maps and descriptions of the approach and descent, it shows you the grade of each route, how escapable they are – whether you have to abseil off certain sections and descend via the glacier (and therefore bring a harness and rope). It isn’t about being brave to try it without the equipment – it is about knowing what you are getting in to and being prepared. The grades run from 1A (the easiest) to 5C (pretty committing and steep). I have ticked off many of these of all grades. One you can easily do without equipment is the Lagazuoi Tunnels (Falz2) route. 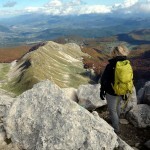 It is the easiest via ferrata grade of 1A and one of the most fascinating. A lot of the gun placements are still there in the tunnels dug by the troops during the wars, along with the barracks and sandbags etc. You can get away without a harness and lanyard for this route – using the cable as a kind of handrail – but a headtorch, gloves and helmet are essential. I wrote a short blog piece on this if you are interested.